Watching Jim Jarmusch's sophomore film Stranger Than Paradise I was reminded of the first time I ever viewed Akira Kurosawa's classic Rashomon. Both films broke barriers and definitions of what cinema was and what it could be and are required viewing for anyone serious about film history. Released in 1950, Rashomon took storytelling to new heights with its distorted flashbacks. When I was watching it I knew that I should be amazed. I should have been overwhelmed by the sheer brilliance of genius on display. And while I thought it was quite good and an important movie I wasn't exactly blown away. I had seen an episode of Saved by the Bell a few weeks prior that mimicked pretty much every convention Rashomon laid down (different remembrances of the same event, non-linear storytelling, etc.) The problem was I had already seen this particular episode of Saved by the Bell (and countless other pop culture trash bins) before I saw Rashomon, which meant that I had already absorbed the derivation before experiencing the original. Through no fault of mine other than being born too late, the element of surprise was gone. When it was released in 1984, Stranger Than Paradise must have felt avant-garde set against the backdrop of what was then contemporary cinema. The concept of independent film as we know it today was virtually non-existent during Reagan's first term. The same could be said for the bleak visual style and use non-actors in this stark character study. Now that Slacker, Clerks, El Mariachi and hundreds of other so-called "indie" films have traveled the path blazed by Stranger Than Fiction it doesn't seem so amazing that a movie where dialogue moves the plot along instead of action could find a place in the cannon. Stranger Than Fiction is presented in a very orderly fashion. The movie is split into three acts complete with a title card announcing each (Act 1 is called "New World," Act 2 is titled "One Year Later" and Act 3 is named "Paradise.") Each scene is shot in one take and the camera hardly moves during any of them. The experience is something akin to watching a slide show as the screen goes black and the soundtrack goes quiet for several seconds between each scene. 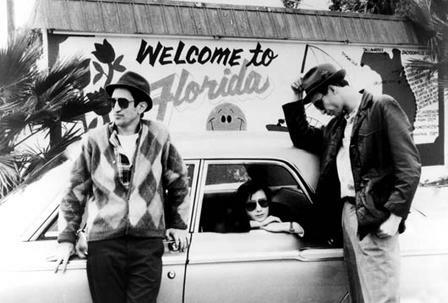 The plot, as much as there is one, centers around three main characters: Willie (John Lurie of Fishing with John fame) is a Hungarian-born New York City gambler who bets on horse racing. Eddie (Richard Edson, the original drummer for the band Sonic Youth whom you might remember from Ferris Bueller's Day Off as one of the devious parking lot attendants) is Willie's friend and fellow gambler, also lives in New York City, but instead wagers on dog races and is slightly less bright. Eva (Eszter Balint) is Willie's cousin who has just arrived in America from Budapest. The film starts when Eva arrives in NYC where she stays with her cousin for a few days before heading off to her mother's house in Cleveland. Eva quickly becomes bored when Willie and his friend Eddie head off to the racetrack without inviting her. As she doesn't know anyone else in town and she no means of transportation all sees of the city is contained within the confines of her cousin's dingy apartment. A year later, Eddie and Willie leave New York and head to Cleveland in a borrowed car after cheating at a card game. There they quickly become bored after they find Eva working at a hot dog stand. After a few days they head out, but not before doubling back for Eva and heading for Florida. Jarmusch is a very quiet director and the arc of his films are quite gentle. Almost every scene shows some spare moment from the character's lives that would have been quickly glossed over in a more mainstream movie (especially in 1984.) There's Willie playing Solitare. There's Eva asking where the vacuum cleaner is hidden. There's Eddie losing at cards to Willie's Hungarian aunt. These are not the common elements of stirring movie moments, but do take up the majority of real life. And that's why highlighting the mundane can seem so revolutionary.